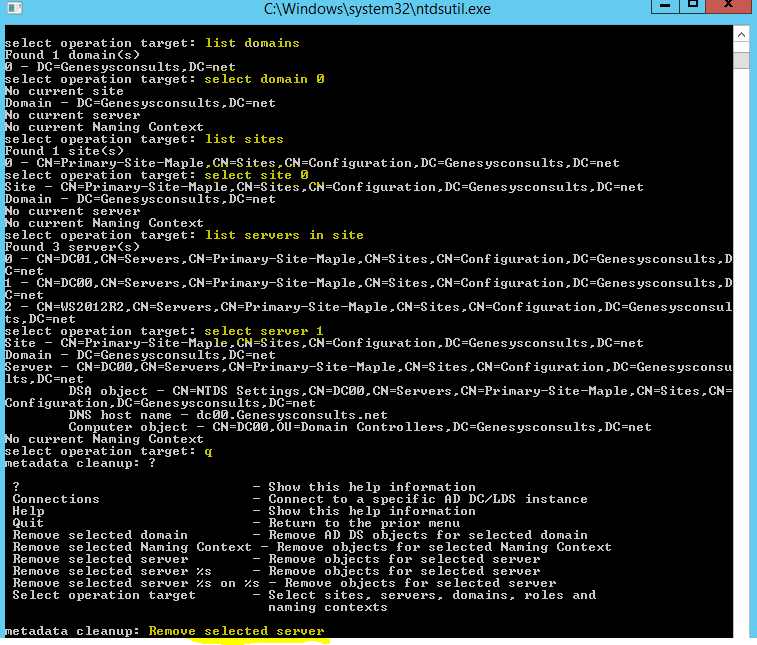 Using NTDSUTIL Metada Cleanup to Remove a Failed/Offline Domain Controller Object. | Chinny Chukwudozie, Cloud Solutions. 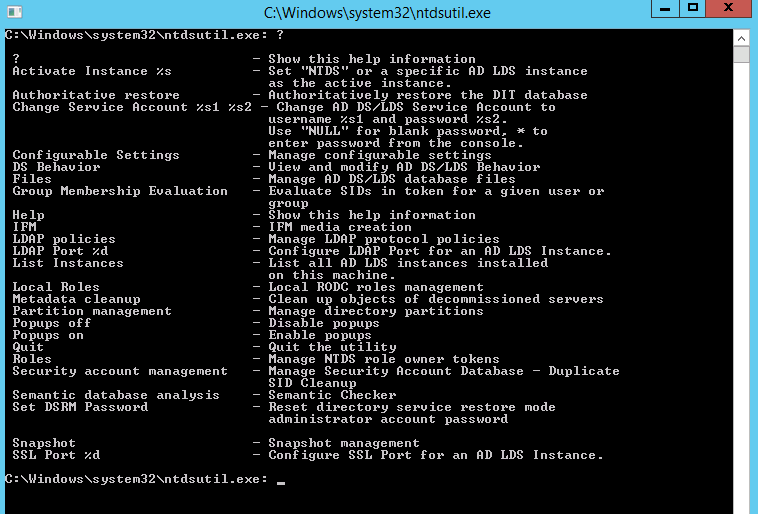 ← Demoting the last Windows Server 2012 R2 Domain Controller with PowerShell. Since a dcpromo was obviously out of the question, I used the Ntdsutil metadata cleanup command to effect the removal in the following steps. At the Ntdsutil prompt, select and type metadata cleanup command and press enter. At the metadata cleanup prompt, type connections and press enter. At the server connections prompt, type connect to server ws2012r2 and press enter. Where ws2012r2 is a domain controller dns name. After connecting to the domain controller, type quit at the server connections prompt to exit out to the metadata cleanup prompt. Now at the metadata cleanup prompt, type select operation target and press enter. Entering this mode, will enable me select the sites, domains and servers I intend to work with. From the help options available at select operation target, select, and type list domains. Press enter. At the select operation target type select domain 0. Where domain 0 is the intended domain. At the next select operation target prompt, type list sites and press enter. At the next select operation target prompt, type select site 0 and press enter. At the next select operation target prompt, type list servers in site and press enter. At the next select operation target prompt, type select server 1 where server 1 is the offline domain controller object I intend to remove. Press enter. At the next select operation target prompt, type quit to exit out to the metadata cleanup prompt. At the next metadata cleanup prompt, type Remove selected server. 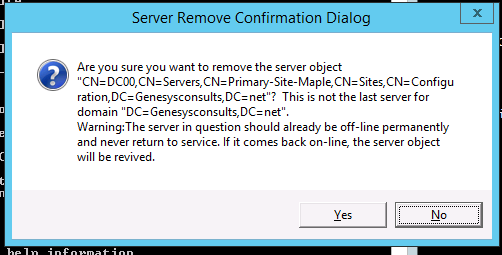 At the ‘Server Remove Confirmation Dialog’, click yes to remove the failed Domain Controller server object.After the removal is successful, I exit out of the ntdsutil tool by typing quit all the way up. I ran the repadmin /replsummary command again to verify and the result shows no replication errors. I still had to go into the DNS forward lookup and reverse lookup zones to manually remove references to the offline domain controller object.I hope this helps. This entry was posted in Active Directory, Active Directory Domain Services, AD Forest, DCPromo, Domain Controller, DSRM, Flexible Single Master Operations, FSMO, NTDSUtil, Windows Server 2008 R2, Windows Server 2008 R2 Backup, Windows Server 2012, Windows Server 2012 R2 and tagged Active Directory, DNS, Domain controller, Flexible Single Master Operations, FSMO, metadata cleanup, ntdsutil. Bookmark the permalink. 15 Responses to Using NTDSUTIL Metada Cleanup to Remove a Failed/Offline Domain Controller Object. Thanks heaps for the post. Make the job easy! Thank you so much for the detailed explanations, as this is not a task we admins do on a daily basis your article helped me a lot. Keep up the good work! Thanks dude. I’m glad you found it helpful. Thank you for the post. it is helpful. Can you also please let us know how to cleanup the DNS? I have demoted DCs (years ago) DNS entries in the DNS server which prevented me to demote DCs recently. Hello Louise, you will have to drill into your DNS Forward lookup zones and manually delete any lingering old domain controllers. Also, in Active Directory Sites and Services, navigate to Sites and Servers and manually delete the already demoted DC server objects. I hope this helps. Thanks. I have done the same steps but in the last its showing an error stating Access dined. I am using an enterprise admin access id. Can you please suggest any solution for this issue. Thank you for the response to my blog. Concerning the error, please make sure the admin user object is a member of the Domain Admins and Enterprise Admins Security Groups. Also, just in case, check the explicit permissions on the restore file. Nice Article…..Thanks for sharing it.